OP Financial Group published its new long-term strategy in June. 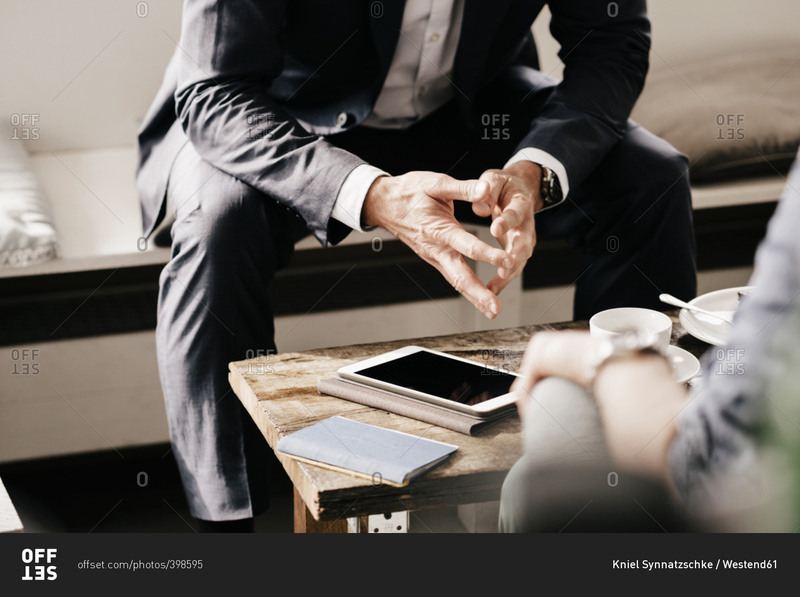 According to the new strategy, we aim to gradually change from a plain financial services provider to a diversified services company of the digital era with strong financial services expertise. The strategy highlights customer experience enhancement by digitising services and processes. In the years to come, we will build fully digital businesses in Banking, Non-life Insurance and Wealth Management. Although we will speed up the digitisation of services, we will also invest in enhancing face-to-face service encounters that meet future needs. In our view, the winning customer experience will be increasingly founded on a collaboration effort between humans and technology. Customers’ increasing expectations and change in customer behaviour encourage us to create total solutions beyond industry boundaries. We will gradually shift the development focus from individual products towards customer-driven service packages. We will develop business models that will reshape markets in, for example, the field of housing, healthcare and wellbeing, mobility, commerce, financial management and security. At the first stage, business diversification involves expanding, for example, the health and wellbeing business. In the years to come, we will make health and wellbeing services our fourth business line. OP of tomorrow will be built around the needs of customers. Based on our mission, we create sustainable prosperity, security and wellbeing for our owner-customers and in our operating region by means of our strong capital base and efficiency. A People-first Approach, Responsibility, and Prospering Together form the basis of our operations. Based on our customer promise “We exist to serve our customers”, customer interests guide all we do. Customers own us and can have their say in our decisions and the development of our activities. A substantial amount of earnings return to owner-customers. As a services provider owned by customers, we have a dual role through which we carry out our mission. In our business role, we provide our customers with the best possible products and services while ensuring our profitability. Success in our business role and financial performance enable us to execute our mission also through community actions, such as our #Suominousuun (Putting Finland on a new growth path) initiatives. We have initiated a large-scale development programme to speed up OP’s reinvention. Annual development expenditure will increase to 300–400 million euros in the next few years, i.e. the amount for the next five years will total up to two billion euros. We will put the strategy into practice through strategic development initiatives. The initiatives involve the development of our present-day business, new business development and the development of new capabilities as well as the promotion of OP’s social role. 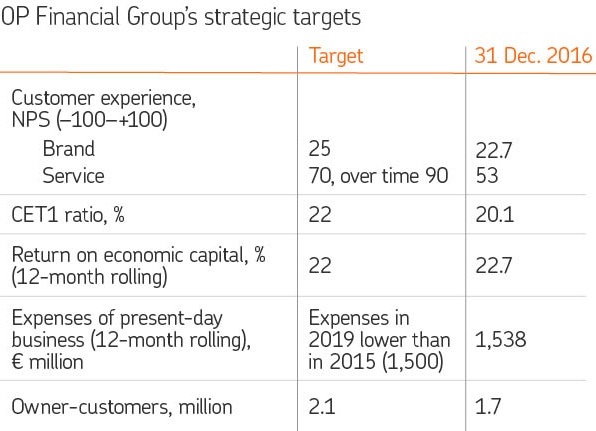 When publishing our new strategy, we also set new numerical targets for our capital adequacy (CET1), profitability (return on economic capital), efficiency (expenses of present-day business) and growth in the number of owner-customers. We put customer experience and its continuous improvement among our key targets when we adopted a new customer experience metric in the autumn of 2016. The new metric is based on the Net Promoter Score (NPS) measuring how likely customers recommend a service. The customer experience metric has two parts, consisting of the NPS target (25) for the brand and the NPS target (70, over time 90) for service. The NPS for the brand is used to measure customers’ experience of OP as a whole. The NPS for service measures what kind of customer experience OP manages to create in individual service encounters in all channels.